Make the most of every gallon. Volvo Construction Equipment consistently offers the best products for the job because each piece of equipment has the technology and power that you need to complete every job. Fuel is one of your largest operating expenses; we want to help you protect your bottom line. We are so confident that we back our excavators, articulated haulers, and wheel loaders with a rock-solid Fuel Efficiency Guarantee. Saving fuel means higher profits for your business. Nuss lets you work smarter and harder. Increase your productivity; find the right fit for your work load and carry operations, civil and building construction, earth moving, waste handling, recycling, landscaping, quarrying, aggregates, block handling, timber yards, agriculture and more. Partner with your Nuss Group & Equipment to create an efficient solution just right for your business. Big on features, protection and reliability. 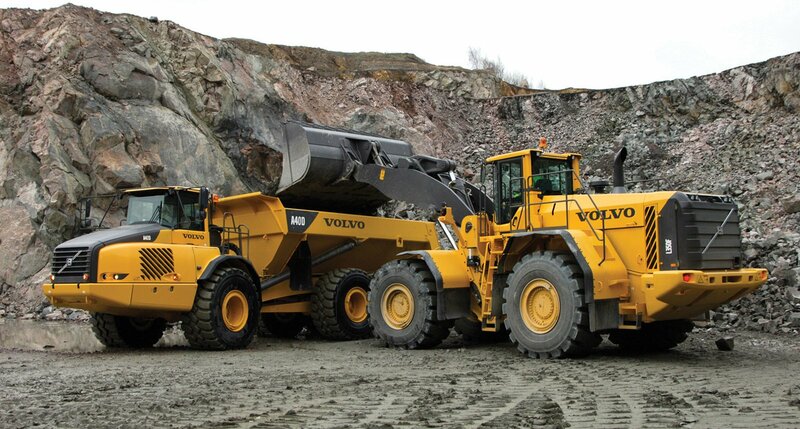 Excellent visibility and operator comfort combined with efficient Volvo engines for increased productivity. More machine uptime thanks to easy access service points. Precise and progressive movements thanks to levers and travel pedals managed by hydraulic servo controls. When you need flexibility and digging performance, Volvo’s wheeled excavators can get anything from general construction to utility jobs done. For your biggest quarrying, mining, road building and general construction jobs, use a Volvo Crawler Excavator. High breakout and crowding force is supported by an advanced hydraulic system that enables smooth, responsive digging and lifting. Machines built for the extreme. Few things in construction put more strain on equipment than moving, sorting, loading and processing demolition debris. Volvo gives oil & gas pipeline contractors a new lift with a revolutionary line of excavator based pipelayers. From the pipe yard to the trench, Volvo pipelayers deliver a competitive edge in even the most demanding conditions - not only in the oil & gas industry. Waste handling presents extreme challenges: dust, corrosion, debris and high temperatures in tight quarters. Knowing these demands Volvo offers the most comprehensive waste handler packages on the market: Be it a landfill, a transfer station or a recycling center, Volvo waste handlers get the job done in a wide range of tough applications - with more uptime, productivity and safety. When you need to haul earth, cut trenches, dig postholes, palletize material, brake concrete or get any number of challenging jobs done, a Radial lift skid steer or Vertical lift skid steer loader machine. Volvo skid steers are one of the most versatile machines on the jobsite. Easier and safer cab access through the side entry door thanks to the single loader arm design. Unmatched visibility on all sides due to the sturdy single loader arm design. Spacious ROPS/FOPS cab designed with operator's comfort and ease-of-use in mind. Clean, efficient, and powerful Volvo supported engines. Large rear door and forward tilting cab provide simple access to all service and key maintenance items.